Stencylpedia → Crash Course 1 → Crash Course: Let's Make a Game! Crash Course: Let's Make a Game! This short, hands-on tutorial will walk you through the steps needed to create a simple platformer using pre-made content, so that you can become familiar with the main parts of Stencyl’s interface. Make sure you download and install Stencyl 3.4.0 (or later) before starting the crash course. This new crash course will not work in 3.3.0 or earlier. This Crash Course requires the Crash Course Kit, which can be downloaded here. 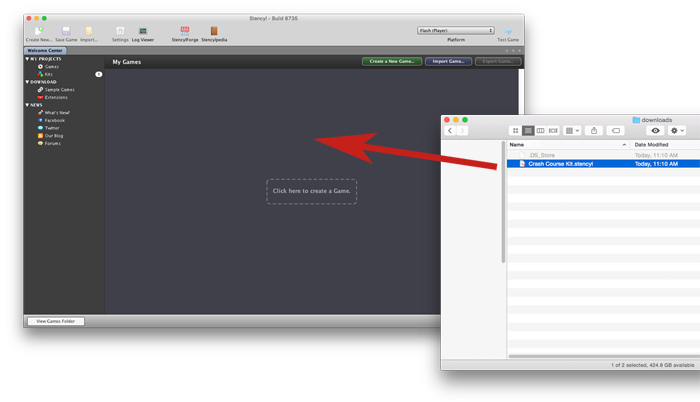 To install the kit, drag the file into Stencyl, like displayed below. Alternatively, you can import it from the File menu (File > Import Game…). When you open Stencyl, you’ll see a screen that looks something like this. This is the Welcome Center. From here, you can either create a new game or open an existing game. 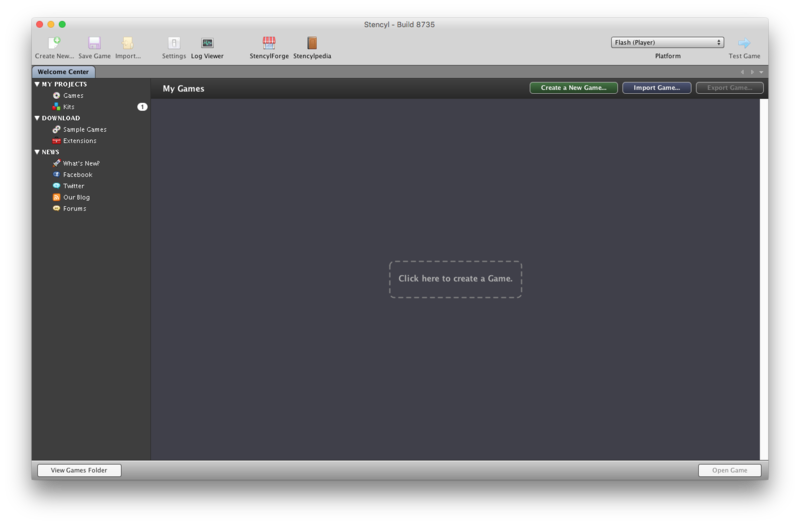 Click the dotted rectangle labeled "Click here to create a Game". 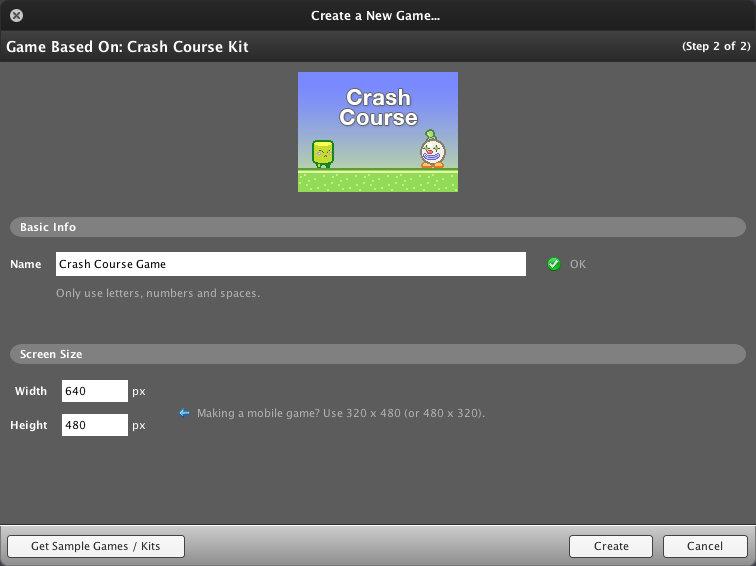 Click on the Crash Course Kit, then click the Next button at the bottom of the dialog. What are Kits? Often times when you create a game in Stencyl, you’ll want to start with a Kit. A kit is a game template that comes with pre-made resources, settings and game logic. The kit you’re starting with here has all the resources you’ll need for the Crash Course. Next, you’ll see a dialog pop up where you can set the game window’s size (in pixels) and name your game. We’re going to name it "Crash Course Game", though feel free to name it whatever you’d like. By setting the Width and Height dimensions in the Screen Size section, you are determining the size of the window/view that the player will see when he or she plays your game. In this case, let’s go with a Width of 640 and a Height of 480. You’ll now be taken to the Dashboard, a central area where you can see and open your game’s resources (actors, graphics, sounds, game logic, etc). Nice course, Stecyl helps me a lot! what i do to change language? @RemingtonCole I checked your game out and it is awesome! Good Job! you should totally make more! 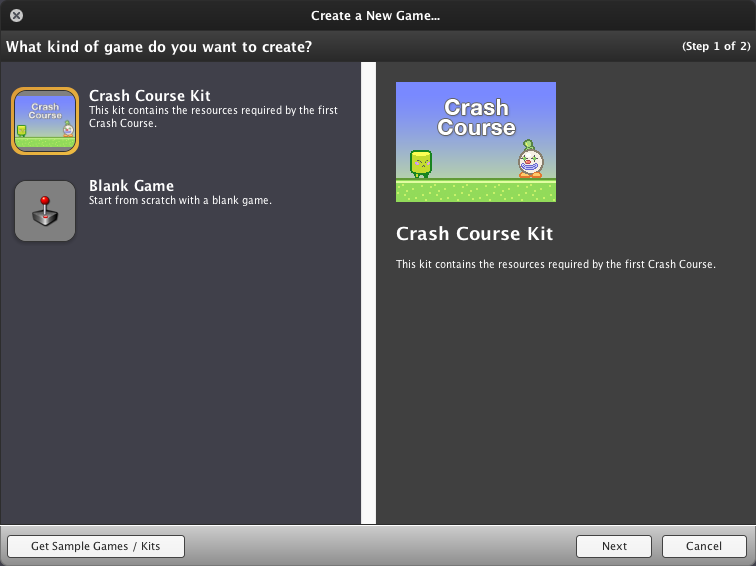 When I try to create a new game, the Crash Course Kit doesn't show up. Is there a reason for this and how do I fix this? Thanks! Hi what if I cant download itwhat do I do?